Important Notice: The Philips Heartstart OnSite is temporarily backordered at the factory level. Orders are being accepted, but please expect delayed shipping. Other Notes: includes 8 year warranty, adult electrode pad cartridge, long-life battery and quick reference card. Why buy? Small and lightweight, pre-connected electrode pads cartridge, on demand CPR coaching, device can be converted into a full function training unit, perfect for "carpeted" environments. The Philips HeartStart family of automated external defibrillators (including the OnSite, FRx, and FR2+ models) is the most popular in the world, and with all the available features you get, it's easy to see why! And take a look at all of the items we include with your Philips OnSite ... you'll know the AED Superstore has the best deal. The Philips HeartStart OnSite AED is a portable, lightweight (just 3.3 pounds with electrode pad cartridge and battery pack) automated external defibrillator available over-the-counter and it's so easy to use. Its voice prompt system even has "on-demand" CPR coaching to help you remember all of the steps during your resuscitation effort. Do you need pediatric capability? No problem! The Philips HeartStart OnSite has optional pediatric electrode pads available. As a matter of fact, the AED Superstore has all of the accessories available for your Philips OnSite AED including cases, cabinets, and training items. The Philips HeartStart OnSite AED makes training a snap, too. Purchase the OnSite AED training electrode cartridge and you can convert your working Philips AED into a non-shocking trainer. When you're finished, reinsert the adult electrode pad cartridge to make your Philips HeartStart OnSite AED ready-to-rescue. Philips has long recognized the importance of delivering life-saving shocks to patients quickly and efficiently. That's why Philips Healthcare is proud of all of their HeartStart defibrillators' "Quick Shock" capability. It takes less than 10 seconds to deliver a shock after pausing CPR which means less wasted time during critical moments with Philips HeartStart AEDs. Philips backs up the HeartStart OnSite AED with an 8-year factory warranty layered with an additional 4-year battery warranty. That's peace-of-mind protection you won't find on many other devices. 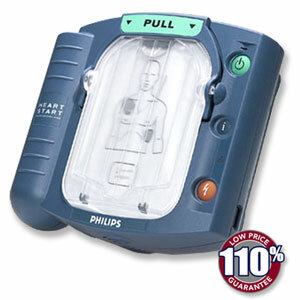 The AED Superstore makes buying your new Philips HeartStart OnSite AED easy and affordable.